Sterling silver and real #8 Turquoise. The inner bracelet circumference measures approximately 6-3/8", plus a 1-1/8" opening, and 1-1/2" at widest point. 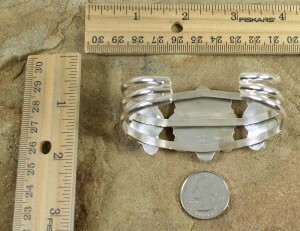 The bracelet weighs 59 grams. 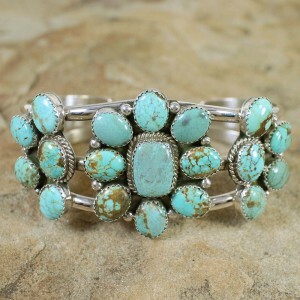 There is nothing at all average about this beautiful bracelet! 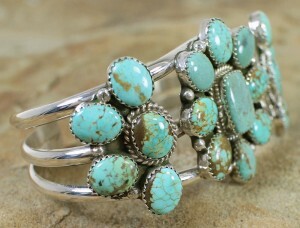 This piece of Native American jewelry is Navajo hand crafted by artist M. Begay, out of genuine sterling silver and a real #8 Turquoise stones. #8 Turquoise is of the highest quality or grade of Turquoise stones in the world, this Turquoise is very rare and looks amazing. The matrix seen in the stone adds character and uniqueness. The bracelet has a total of NINETEEN stones that are carefully placed in hand cut bezel settings, while being accented by mini silver beads and twisted silver for a fabulous finish. 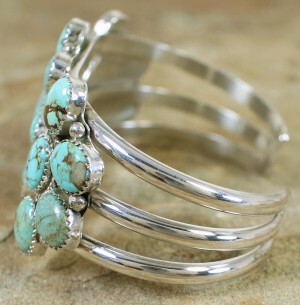 THREE silver bars create the cuff and complete the bracelet to perfection! 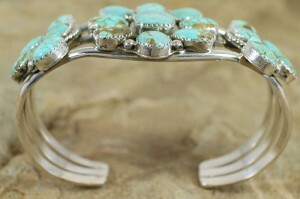 The bracelet is stamped sterling and is hallmarked by the artist.